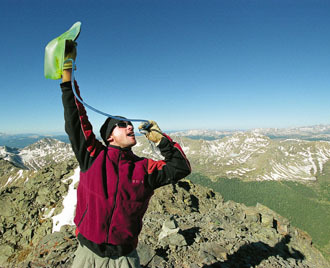 Intrepid Mountaineer, Michael Brands gets a gravity fed swig of water at what could be nearly 14,000 feet on Grizzly Peak. The popular peak is in the guidebooks and on the maps as 13,988. Daniel Bayer photo. Ever stare down from the top of Highland Peak – knees trembling, preparing for the first ski turn – and swear you were higher than you imagined? Did that grunt up Independence Pass on your bicycle seem a few feet higher than the map indicated? Turns out you were right. A branch of the federal government called the National Geodetic Survey is recalculating the elevations and locations of survey points across the country, including many on Colorado’s peaks. It is finding that mountains are generally five to seven feet higher than previously believed. “I’ve always felt this bean-counting stuff is a lot of fun,” said Carbondale mountaineer Lou Dawson, who has written guide books detailing Colorado peaks over 14,000 feet. The problem isn’t due to mistakes made with the old surveys, stressed Jack Reed, a geologist with the U.S. Geologic Survey in Lakewood. It’s due to an adjustment of an imaginary surface called the geoid. The USGS topographic maps that are the staple of backcountry adventurers used information based on a geoid calculation from 1929. The geoid is always perpendicular to the plumb line, or the direction a string would fall with a weight attached, according to Reed. New elevations are based on a geoid calculated in 1988, after it was discovered that gravity from massive mountains created greater variations. But climbers need not plan on bagging any “new” 14ers or bother recalculating their vertical gain. Nevertheless, it’s kind of exciting in a trivial sort of way to know just how high you hiked or climbed. “Mountaineers in general are goal-oriented,” noted Dawson. They like to know things like just how high they climbed. Well, now they have all sorts of new figures to pick over. According to the National Geodetic Survey, Maroon Peak gained in elevation from 14,157 to 14,163 feet. North Maroon gained on its sister – rising seven feet from 14,012 to 14,019. Nearby Pyramid Peak also gained seven feet from 14,018 to 14,025. Reed estimated that the NGS Web site features recalculated elevations for about one-third of Colorado’s mountains. Surfing the site indicates that most of the high peaks in Pitkin County were recalculated. Capitol Peak was an exception. For now it remains at 14,130 feet. Snowmass Mountain increased from 14,092 to 14,099 feet. Castle Peak’s new assessment boosts it from 14,272 to 14,279 feet. Nearby Cathedral Peak gained in stature by six feet but still falls 50 feet short of the 14,000-foot level. Grizzly Peak came even closer to becoming a 14er. Its new elevation is 13,995 feet – up from the 13,988 previously calculated. Mount Elbert, between Aspen and Leadville, holds onto the title as Colorado’s tallest. Its elevation climbed from 14,433 to 14,440 feet. Highland Peak, which cradles the extreme skiing of Highland Bowl, now tops out at 12,392, up from 12,386, according to the National Geodetic Survey. To thoroughly confuse the matter, Aspen Skiing Co. trail maps show that peak at 12,382 feet. Reed said the new elevations probably won’t be known for years by anyone but those who seek the data from the NGS Web site. The USGS doesn’t have the money for frequent revisions to its thousands of maps covering the country. For those who want to delve into backcountry elevation trivia, go to http://www.ngs.noaa.gov and click on the “data sheets” section. It helps to come prepared with a list of the quad maps that contain the mountains or other features you want to check for elevation. Surfers of the Web site will be asked for a quad, then the next screen will have specific locations that can be clicked on, leaving the setting on “any horizontal and/or vertical control.” Click the site you want using the “get data sheet” icon. The information will show current survey information and superseded survey information. It’s not just prominent peaks that were recalculated. The summit of the Williams Mountain range east of Aspen grew from 13,315 to 13,321 feet. A point near the summit of Independence Pass went from 12,130 to 12,136 feet. Basalt Mountain gained six feet to 10,882. Oddly enough, Aspen itself produced the only lower elevation in a scan of the recalculations. The bridge over the Roaring Fork River in east Aspen was determined to be 7,935.5 feet, down from 7,940, apparently confirming the suspicion that Aspen is sinking.